Here we are at the end of this month long series of 'Explore the Flavors'. It has been an interesting journey exploring healthy recipes under different themes. To cap this journey, I shall post a recap in a couple of days. As far as today's dessert is concerned, I chose to post a guilt-free dessert to end this series. It is very close to my heart as I make it for my little one and myself, when the sweet craving hits :). In my growing up years, my mom used to make it for me as I refused to consume milk in any form. After so many years, I remembered this kheer and made it for the Ugadi platter. It has since been made in many avatars. I sometimes, add just banana puree for myself and dates and banana puree for my little one. She is fine with just sugar as well. In a heated pan, add ghee and cracked wheat and roast for a minute. Add about 1 cup of water, cover and let the cracked wheat cook (upto 7 minutes depending on the size of the grain). Meanwhile blend the dates, banana along with 1/2 cup of milk. After the cracked wheat is cooked through, add 1 cup of milk, chopped nuts, saffron soaked milk and let it come to a boil. Add the banana-date-milk mixture and allow it to come to a boil. Remove from heat. Cover and rest it for a few minutes. Serve warm for a guilt free dessert or snack. I just realized that we are nearing the completion of this month long 'Explore the flavors'. We are thoroughly enjoying this series. hope all of you are as well. I shall post a Recap of the series in a few days. This is one of my favorite ways to consume Oats. As a South Indian it is expected that I make sambar everyday. We love the homey dals with greens, so they get done everyday. I make Sambar once in 10-15 days. Inevitably it gets leftover for the next day. My family is not so fond of Sambar with idlis. So I do a happy dance and make this Sambar oats for my older one and myself. 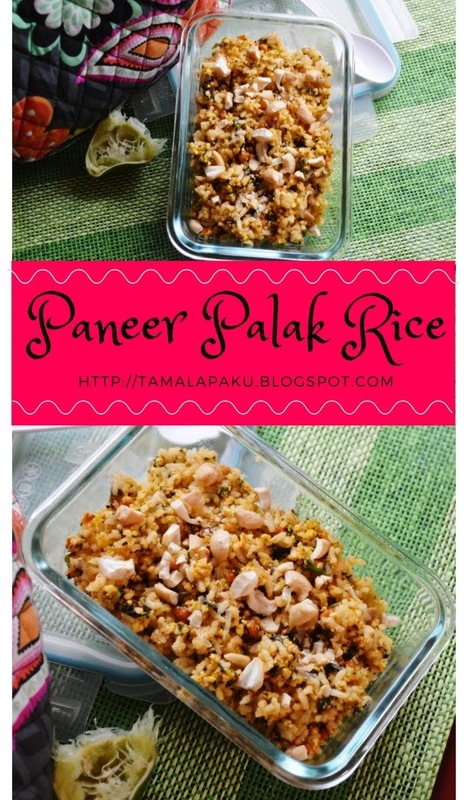 My little one will eat this if I make papad as an accompaniment. Oh My God! I just realized that I have not posted the humble everyday sambar which I make at home. The link for Sambar I have given below is a special version of Chettinad Sambar. Roast the rolled oats in a heated pan until they turn golden brown. Remove from heat. Set aside and pour hot Sambar into it. 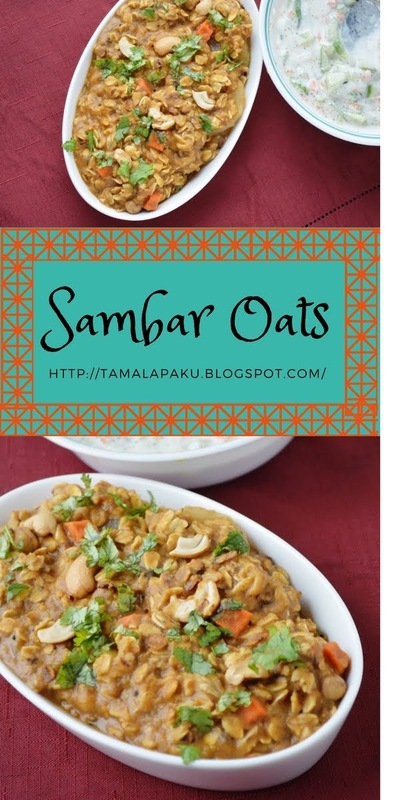 Prepare the seasoning and mix it in the Sambar oats. Here is a variation of the traditional Adai but without the red chilies and other traditional components. 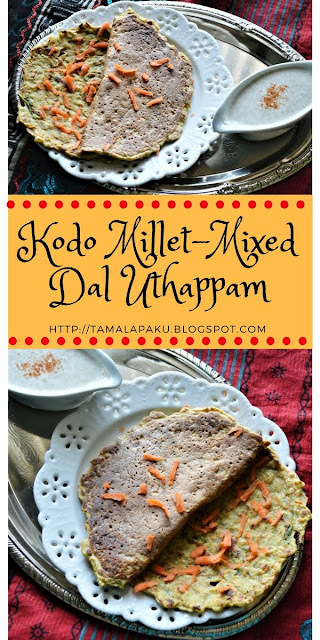 I have used Kodo Millet in place of rice and made this healthy version of uthappam. I love to make such no ferment dosas and uthappams which are sometimes life savers. 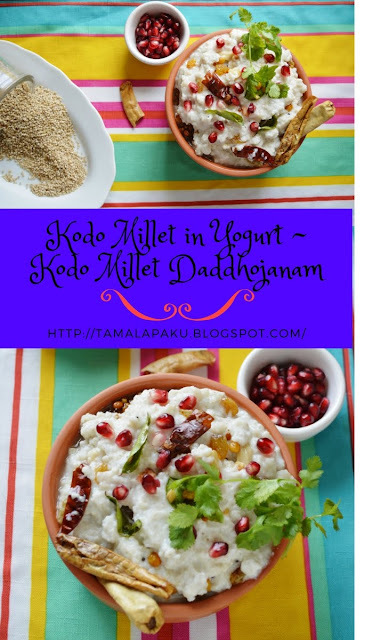 This was another way I used Kodo Millet without anyone the wiser. Soak kodo millet, moong dal, chana dal, urad dal, toor dal and red chilies for about 4-5 hours or over night. Drain and grind the soaked millets and dals along with ginger and green chilies using as much water as needed to make a fine batter. In the ground batter, add cumin seeds, chopped vegetables, coriander leaves. salt and asafotida. Add adequate water to adjust the consistency of the batter. Heat a griddle, pour a ladle full of batter and gently spread to make a 5-6 inch uthappam. Spray oil as needed and let it cook. Flip and cook the underside as well. Remove and continue with the next uthappam. Serve warm with any choice of chutney. Another new whole grain which I have started experimenting recently is Buckwheat. I have used Buckwheat Flour before but never the groats. I felt that the consistency of the cooked groats is pretty easy to get used to. I had lined up another whole grain for today but it didn't work out. So, changed it in the last minute. This kheer was enjoyed by the sweet lovers at home. 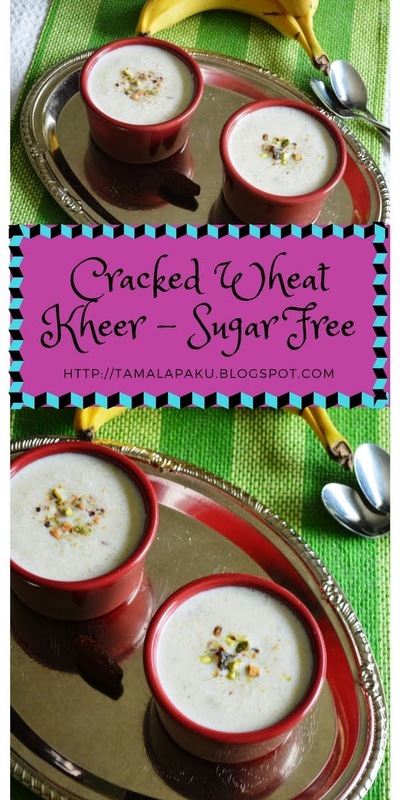 The one change I would do to this kheer is to roast the groats before cooking it. I feel that it would alter the flavor. 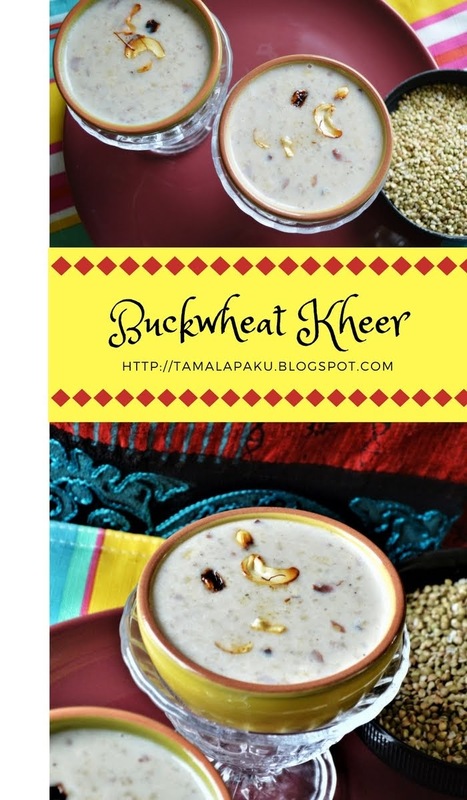 I shall definitely update when I re-do this kheer. When it is safe to remove from the pressure cooker, take it out and transfer into a heated thick bottomed pan. Gently mash, either with a hand held blender or with a potato masher. Add in the crushed nuts, sugar and about 1/4 cup of milk to adjust the consistency. Sprinkle cardamom powder. Let the kheer simmer for about 3-4 minutes. Remove from heat. In a different pan, heat the ghee and roast the cashews and raisins. Set aside for garnish. I finally could lay my hands on Kodo Millet at a local Indian Store. I paid a pretty penny for it, though. I have tried quite a few dishes with this millet. I found that it is not very difficult to like it as it doesn't seem to have any distinct smell or taste. In fact when blended with Yogurt and the seasonings, it is not very different from the rice version. 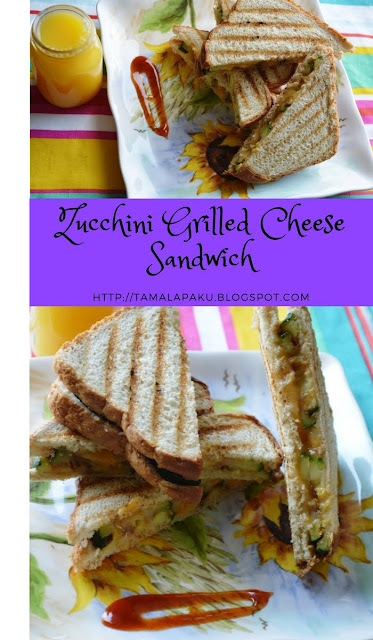 This is also a favorite lunch box dish for my little one. I was in two minds whether to post it under Kid's lunch box recipes or under the Whole grain recipes :). I typically don't add ginger and green chilies for my little one. I just add a little black pepper and loads of crunchy dals (she calls them 'katum kitum') and raisins in the tadka for her. Wash kodo millet and soak it for 5-10 minutes. I observed the water turns a little muddy, so I like to soak and make sure the muddy colored water is all washed out. Add in milk and yogurt. Mix well. Sprinkle salt and grated ginger. To prepare the seasoning, heat ghee/oil, add mustard seeds, after they are ready to crackle, add the remaining ingredients in the order listed. After the dals are brown, transfer the seasoning ingredients into the kodo millet daddhojanam. Mix well and garnish with pomegranate pearls. Enjoy with fried mirchi! After Jowar and Whole Wheat, I picked up Barley as my Whole Grain for today. Here the traditional Pulihora is made replacing rice with barley. The weekend meal depicted above has Roti, Tomato Sabji, Rice, Motichur Laddu, Palak Dal, Barley Pulihora and Yogurt apart from carrot salad and chips. The chips and Motichur Laddu were store bought. I learnt that the texture of barley is a tricky one to get used to. But it is one of my favorite grains apart from millets. I felt barley is best consumed in this form of pulihora where the taste of the tamarind mix overtakes all else. Pressure cook/microwave the tamarind with 1/4 cup of water and upon cooling I make a fine paste, sieve and discard the pith. Set aside the extract. Wash and cook Barley in 1 cup of water either in the pressure cooker or in a pan on stovetop. Fluff and spread the cooked barley pearls in a wide bowl/tray. Grind the ingredients listed under 'To Grind' into a fine powder and set aside. In a pan, heat oil and add in the seasoning ingredients. After they are all browned well, add in the turmeric and tamarind extract. Let the tamarind extract cook well and become a little thicker. Add salt and the powder which was set aside. Mix well. Remove from heat. Add the tamarind mixture to the cooked barley, mix well and make sure every grain of barley is coated with the tamarind mixture. 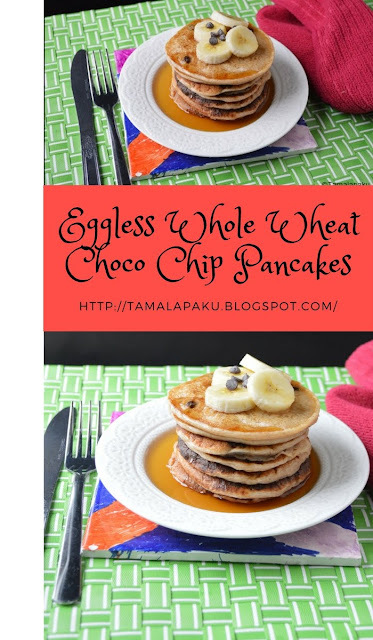 In continuation to the Whole Grain theme, here are some humble pancakes made with whole wheat flour. I sometimes add flax meal whisked in warm water as an egg substitute. But just buttermilk also works well. This is my go-to pancake recipe for my little one. I usually freeze the leftover pancakes and they work very well for busy mornings. They are her favorite when I am not home as she can pull them out the freezer, thaw them in the microwave, add whatever fruits are in the fruit basket and her after school snack is done without waiting for me. Sift the flour along with salt, baking powder, cinnamon powder and sugar. Add in the chocolate morsels to the flour and gradually pour the buttermilk in the flour mixture and gently mix until the right consistency is reached. On a hot griddle, pour 1/4 cup of batter for each pancake. Let it cook on one side, then flip and cook on the other side. Top it with sliced banana, chocolate morsels, and maple syrup and serve warm. Welcome to the last week of 'Explore the flavors'. This week I shall post some Whole Grain recipes. Today the star grain is Jowar. The benefits of Jowar are innumerable. I try to incorporate Jowar in our diet in many ways. Recently, I have been able to lay my hands on cracked jowar at a local Indian store. I have used Jowar Rava before when I brought a pack of Jowar Rava from India. Here are some recipes where I have used Jowar Rava. I have made this vegetable khichdi both in the regular pressure cooker and also in an Instant Pot. So I have mentioned the process for both. When cooking in the regular pressure cooker, I found that presoaking is faster and cracked jowar cooks well. Wash the cracked Jowar and soak for a few hours. Wash moong dal and set aside. In a pressure cooker, prepare the seasoning. After the mustard seeds pop, add all the vegetables, pepper, ginger, green chili paste, turmeric and the soaked cracked jowar and moong dal. Sprinkle salt and add about 4 cups of water. Cook for about 20 minutes or for 4-5 hisses. Allow the pressure to be released and remove. Squeeze in lemon juice and serve hot with ghee and papad. Wash the cracked Jowar, moong dal and set aside. Power on the Instant Pot in the 'Saute' mode. Once the display says 'Hot', add oil and the rest of the seasoning. 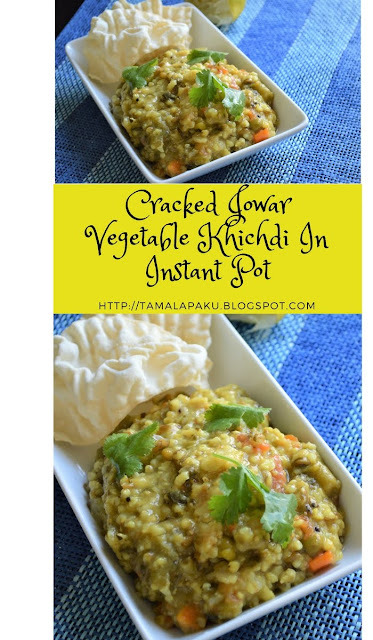 After the mustard seeds pop, add all the vegetables, pepper, ginger, green chili paste, turmeric and the washed cracked jowar and moong dal. Cover with the lid, set it to 'Porridge' mode. Make sure it is set to the 'sealing' mode. [It displays a time of 20 minutes]. Let it naturally release the pressure. Squeeze lime juice before serving. To end this series of Kid's Lunch box Ideas, here is another of my little one's favorite. It is so easy to put together and healthy as well so I prefer to make this weekly once for her. Please note that I have barely used any spices as my little one cannot handle the spicy stuff. So I added only some pepper powder and loads of nuts. In a heated pan add oil, chopped nuts and cumin seeds. After they crackle, saute ginger-garlic paste for a few seconds and then saute onions until golden brown. Add in the tomato puree, turmeric and salt. Let it boil and the mixture come together. Cover and let it cook for a couple minutes. Add in the chopped palak and shredded paneer. Mix well and let the flavors blend for a few minutes. Sprinkle garam masala and pepper. Add in cooked rice, mix well. Remove from heat. Sprinkle lemon juice. This sandwich was an accidental find when my older one was looking for vegetable based sandwiches. As far as I understand she saw some ideas on her social media page and was confirming with me if she might like something like this. It has been since a favorite of hers and the husband wouldn't mind a sandwich or two as well. The key is to lightly toast the bread slices. I have learnt with experience that the zucchini when placed on the bread slices, will make it soggy. Toasting the bread makes it slightly immune to that. When it comes to packing for the lunch box, wrap the cooled sandwich in a wax paper and then wrap it in a foil. In a hot, greased grill pan, arrange the zucchini slices and grill them until the grill marks are visible. Remove onto a bowl, sprinkle salt, garlic powder and red chili powder and toss them so the slices are evenly coated with the spices. Arrange these seasoned zucchini slices on two bread slices, sprinkle cheese, cover with another bread slice, grill it until the grill marks are visible. Repeat for the other set of bread slices. Allow it to cool on a wire rack, wrap it in a wax paper and foil wrap it to pack it for lunch.